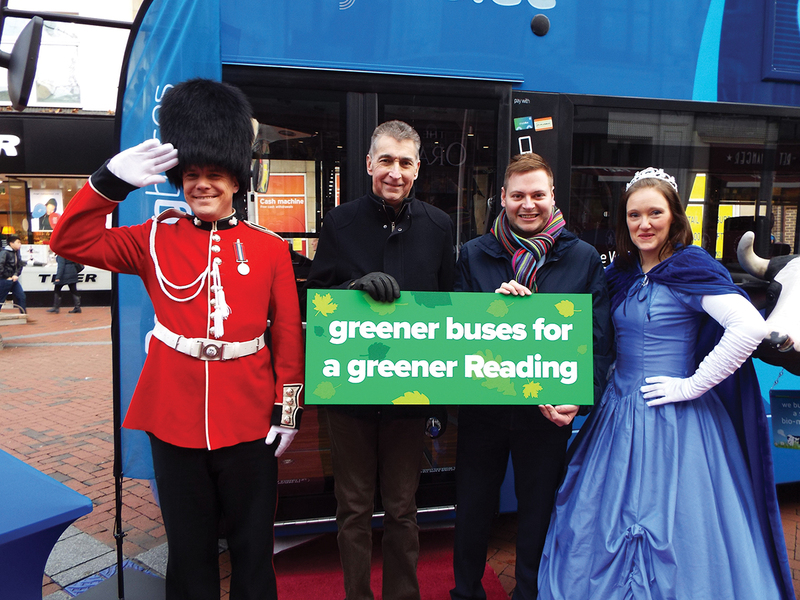 Reading Buses CEO Martijn Gilbert (centre left) and Cllr Tony Page, Lead Member for Strategic Environment, Planning and Transport, Reading Borough Council, with royal guard Tommy West and Reading Buses Marketing Manager Nikki Ball. On the ADL stand at the EBE 2016. On the ADL stand at Euro Bus Expo 2016. On the ADL stand at EBE 2016. A table with Aircharge facility is installed on the upper deck. Gas storage tanks are installed behind the rear row of seats on the upper deck. In place on Broad Street with green ‘another gas powered bus for Reading’ flash prominent. Double decker Euro6 gas bus unveiled at public celebration in Reading town centre. On Saturday, Reading Buses formally launched the Scania Euro6 gas bus with an event in the town’s Broad Street described by CEO Martijn Gilbert as a ‘regal affair with royalty aplenty.’ The company will be the first to operate the new type of super environmentally friendly bus. Alongside the display of the promotional vehicle in Reading Buses’ striking Royal Blue route colours, there were performances throughout the day from the John Madejski Academy Choir and Reading Buses own royal guard Tommy West, together with a magical appearance by Snow Queen Elsa. Reading Buses staff were also on hand to provide information to customers, as well as some royal sweet treats. 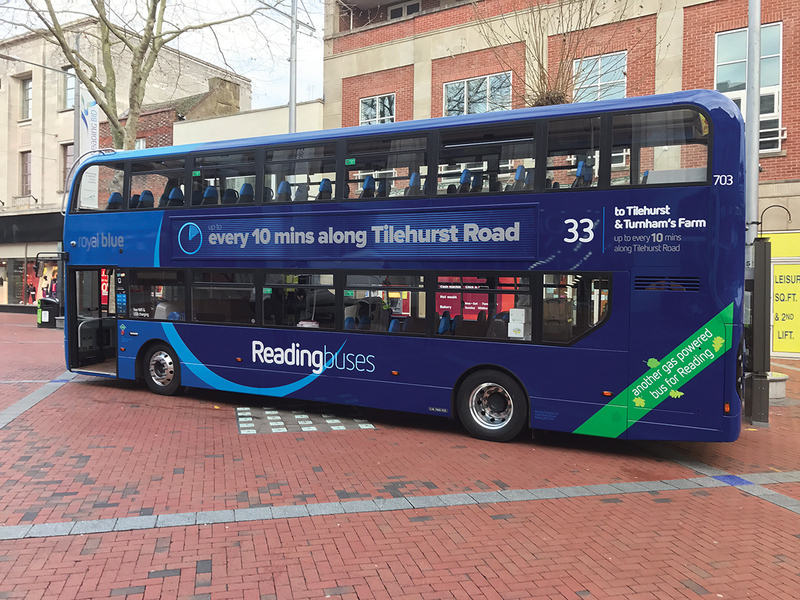 The five new gas buses are being deployed on Reading Buses Royal Blue routes 33 and 33a, helping improve the air quality in the Thames side corridor running towards Tilehurst from the west of Reading town centre. The 33 and 33a routes run up to every ten minutes along the Tilehurst Road to the Triangle, with every second bus continuing via Little Heath Road to Turnham’s Farm. Launched at Euro Bus Expo 2016, the ADL Enviro400CBG bodied Scania N280 UD 4x2EB features Scania’s five-cylinder, nine-litre, Scania OC09-101/280 Euro6 dedicated gas engine delivering 280hp coupled to a ZF Ecolife transmission. Gas is stored at 200bar in high pressure cylinders located under the stairs and in a compartment behind the rear row of seats on the upper deck with a total capacity of 750 litres. By using natural gas from sustainable resources (biogas), the vehicle is virtually carbon neutral and qualifies as a low emission bus (LEB) under the definitions introduced by the Office of Low Emission Vehicles (OLEV) in 2015. Reading Buses’ gas fleet is fuelled with sustainable biogas produced from farmyard slurry (‘cow poo’) and supplied by the Gas Bus Alliance. The dedicated gas engine also emits virtually no particulates, significantly reduced levels of nitrogen oxide and virtually zero ‘methane slip’ (the pass through of unburnt gas). 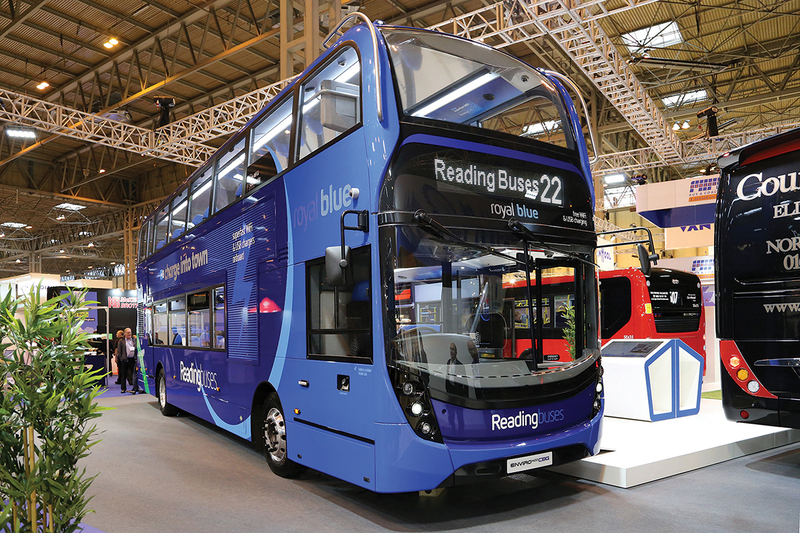 With the experience of operating 35 gas powered single deck vehicles from the same partnership, Reading Buses were quick to place the first order for the new model on a commercial basis. 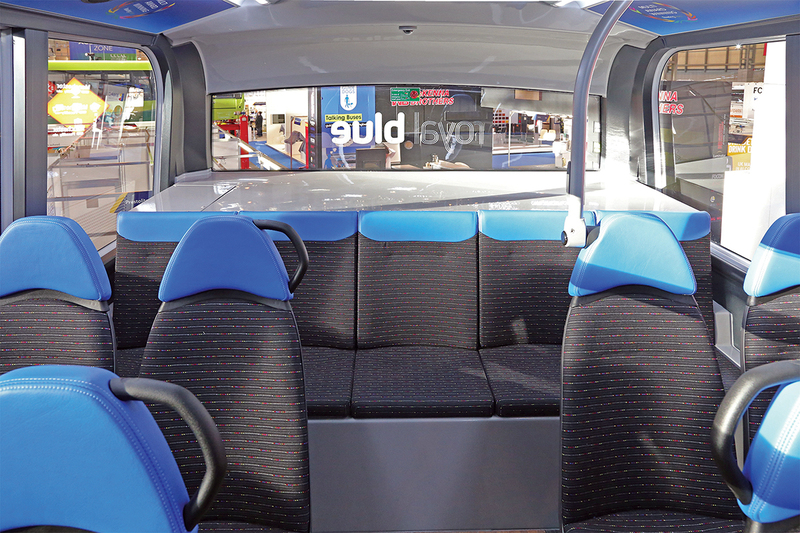 These first five vehicles for Royal Blue are 11.4m long with 72 high backed Isri Civic V3 seats trimmed in Reading Buses own flat weave cloth material. 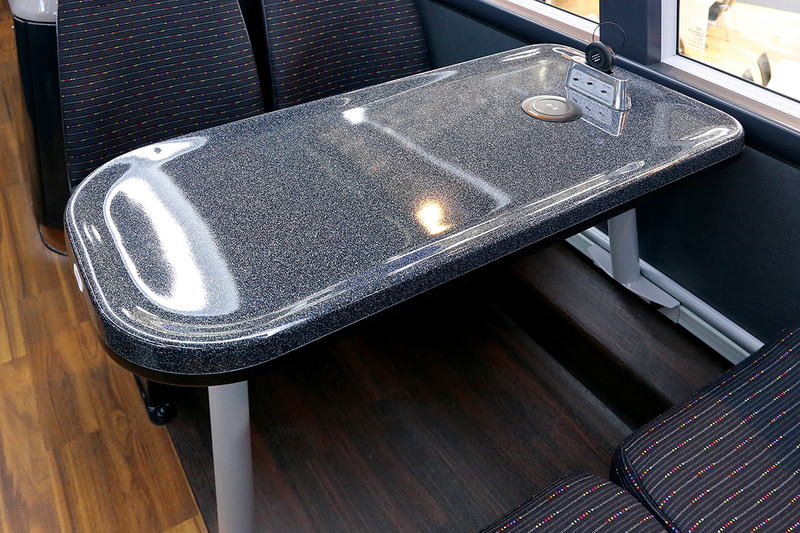 USB power points and coat hooks are available at every seat and a table on the upper deck offers an Aircharge wireless charging pad for phones and tablets. Litter bins are also provided on both decks. Customers benefit from free superfast 4G Wi-Fi and audio/visual next stop announcements. 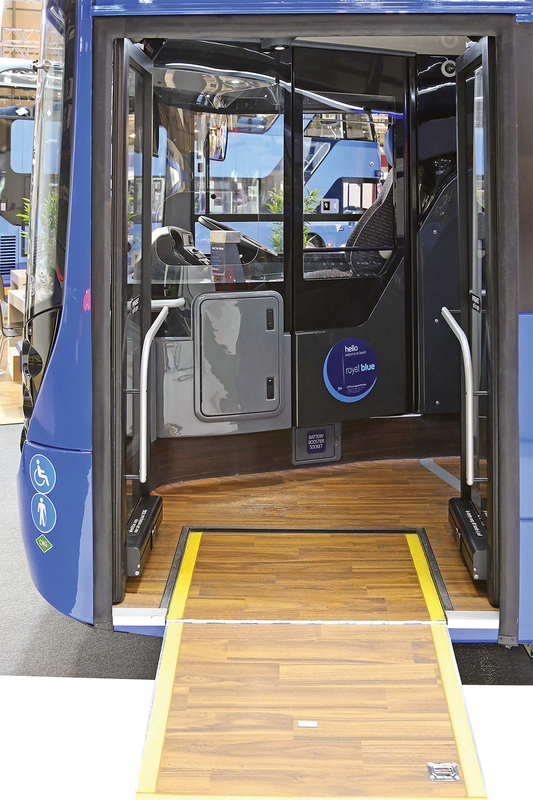 The buses also feature two wheelchair bays, meaning that, for the first time, two wheelchair users can travel together. 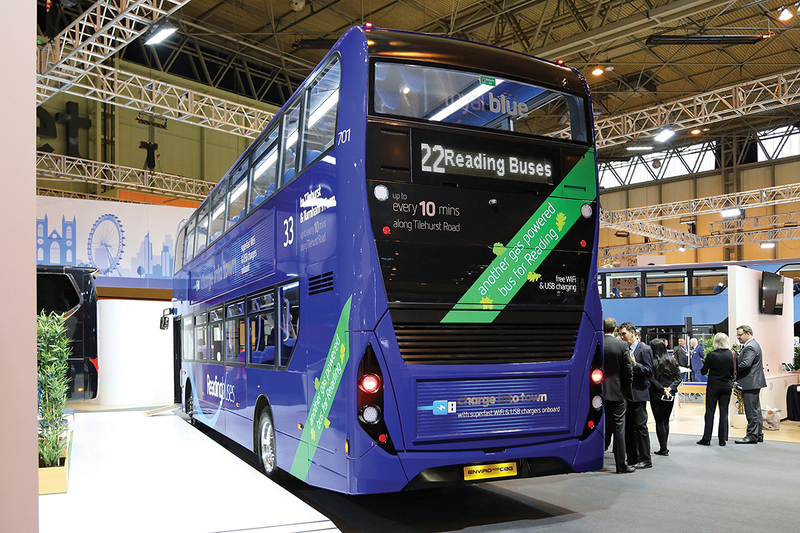 Reading Buses describe this as a pioneering trial on a British local bus service and will be monitoring its use with interest to consider its roll out on future new vehicle orders. Following the acquisition of the first five Euro6 gas double deckers as a commercial investment based on economy of operation using the company’s existing gas infrastructure, Reading Buses were awarded grant funding by OLEV in 2016 for further investment in gas operations. This covers an additional16 similar vehicles and upgrading the Wartsila supplied gas storage and refuelling facilities at the company’s Great Knollys Street depot to provide additional capacity. Preliminary work on the latter has recently commenced.